They have similar fashion senses and food preferences, and they even start getting hungry at the same time. These two close friends are the same age, and with their preferences at the front and centre of this discussion, they look back on the past ten years. I get the feeling that the two of you really enjoy fashion. Have you gone shopping together before? Tokunaga: We often do. We go to places like Harajuku and enter all sorts of stores. We tend to like the same clothes, so we also like to go to the same stores. Natsuyaki: At stores, we'd both think about how we'd match the clothes, and on that note, we'd coordinate. Like what sort of clothes and accessories we'd use to bring out the style we'd like. Tokunaga: Like we're store assistants (laughs). Whenever I hear any news about our favourite stores stocking new products, I'll generally get in touch with Miya immediately, and invite her to go the next day. 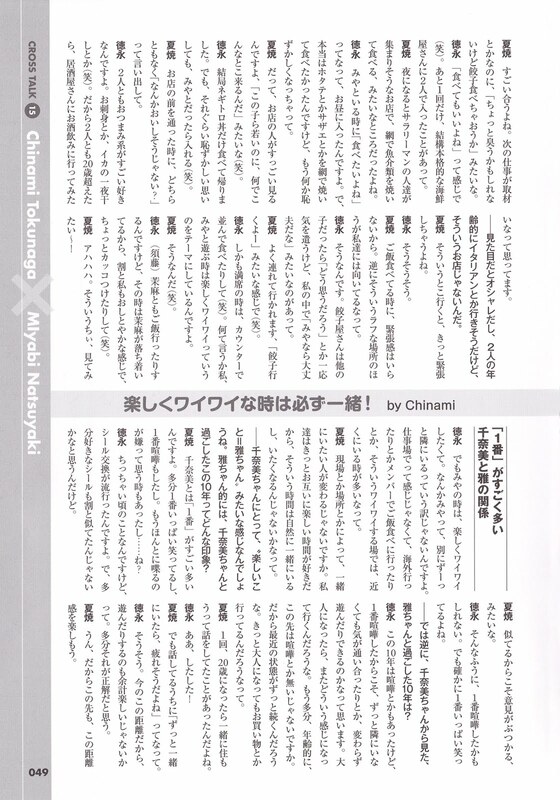 Natsuyaki: That's right, Chii will bring me along to stores that she'd like to recommend. She pretty knowledgeable about those things. She's very good at finding her way to them as well. Tokunaga: If I see a store in a magazine that tickles my fancy, I like to look up where it is. I get all sorts of information from my sister who's two years older than me. 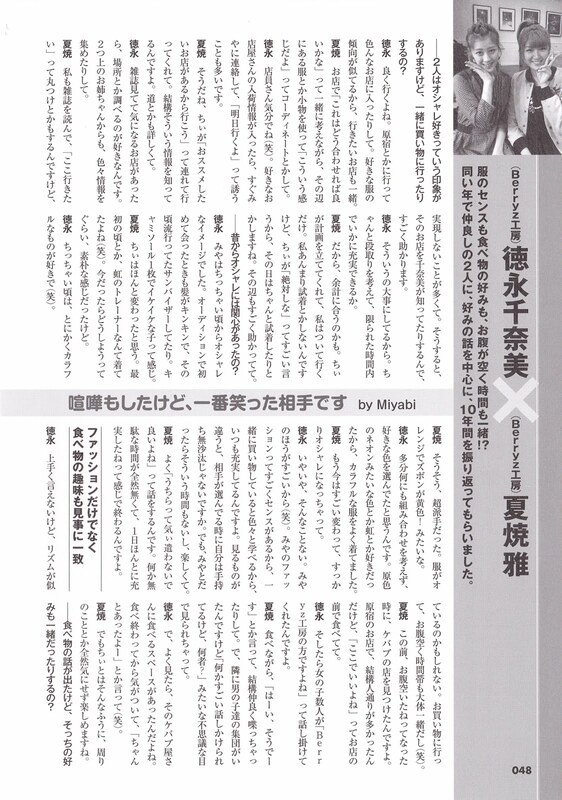 Natsuyaki: I circle the places that I'd like to go in the magazines I read as well, but it often doesn't materialise. Having done that, Chinami will know the store, so she's a real great help. Tokunaga: That's important. Having properly made arrangements, I figure out how to fully utilise the limited time we have. Natsuyaki: And so, things fit quite well. Chii makes the plans, and I'll just follow along. I don't really try on clothes, but I'll properly try things on on the days when I'm with Chii, who'll keep on telling me that it'll work. That's really helpful. Did you always have an interest in fashion from way back? Tokunaga: I always thought that Miya was fashionable, ever since we were small. When we first met, her hair was blonde, and she was wearing an in-fashion sun visor. It felt like she was a camisole-wearing, outgoing girl. Natsuyaki: Chii has really changed. At the start, she wore rainbow trainers (laughs). She was so plain that if you were to see how she looked like now, you'd wonder what was up with her. Tokunaga: When I was small, I generally liked colourful things (laughs). Natsuyaki: That's right, you were super flashy. Like, you'd be wearing something orange with yellow trousers! Tokunaga: I probably put it together without thinking, picking out my favourite colours. I liked neon-like primary colours and rainbows, so I often wore colourful clothes. Natsuyaki: Now you've really changed, you've become proper fashionable. Tokunaga: No, no, nothing like that. Since Miya's way more amazing (laughs). Miya's got such great fashion sense, so I learn all sorts of things when I go shopping with her, it's always fulfilling. Most people would generally twiddle their thumbs if their partner is looking and picking out something different. But that doesn't happen with Miya, so it's fun. Natsuyaki: We often say that we don't have to be careful around one another. There's no wasted time at all. The day feels really productive. Tokunaga: I'm not sure if this is the right way to put it, but our rhythms might be similar. When we go shopping, we generally get hungry around the same time (laughs). Natsuyaki: The other day, when we were hungry, we found a kebab shop. It was a store at Harajuku, and lots of people were passing by, but we were okay with eating in front of the store. Tokunaga: And then, some girls came to talk with us, recognising us as Berryz Kobo. Natsuyaki: We admitted it, and we had quite a friendly chat as we ate. And, there was a group of guys next to us, giving us strange looks, wondering who we were as they listened to us. Tokunaga: And, when we took a good look, that kebab store had an eating space. We realised it after we were done eating (laughs). Natsuyaki: But Chii, you're like that, you always enjoy yourselves without minding your surroundings at all. Now that we're on the topic of food, are your preferences the same for that as well? Natsuyaki: They really match. Like, we'll go and have gyoza, even if we have an interview job after that, despite the possibility that the smell might linger. Tokunaga: We permit ourselves (laughs). And the two of us have been to a fully proper seafood store, just once. Natsuyaki: It was a store that looked like it would be packed with salarymen at night, where you grill your seafood and eat it. Tokunaga: I felt like eating it when I was with Miya, so we went during lunch. There, we just wanted to grill and eat urchins and turban shells, but it was kind of embarrassing. Natsuyaki: You know, since the store workers were really looking at us, like they were wondering what these young girls were doing there (laughs). Tokunaga: In the end, we only ate negitoro-don and went home. But even despite all the embarrassment, the reason I could go in that store was because I was with Miya (laughs). Natsuyaki: When we were passing by in front of the store, one of us said that it looked like the store sold good stuff. Tokunaga: The both of us really like side dishes. Like sashimi or dried squid (laughs). So I think when the both of us are over twenty, we'll probably go drinking at an izakaya. Based on your looks and your ages, I would have thought that you'd be more likely to go for Italian. Natsuyaki: It definitely would be nerve-wracking to go to those sort of places. Natsuyaki: Since I don't want to be nervous when having a meal. Instead, we actually feel more comfortable with those less-uptight places. Tokunaga: That's right. If I were to go to a gyoza store with other girls, I'd generally be on my guard, wondering what they'd think of me, but on the inside, I'd be telling myself that it would be fine if I was with Miya. Tokunaga: What's more, if the seats are packed, we'll line up and eat at the counter (laughs). How would I put it, when I'm hanging out with Miya, my main goal is to enjoy myself excitedly. Natsuyaki: Is that so (laughs). Tokunaga: I go for meals with (Sudo) Maasa, but at those times, since Maasa's chill, I get relatively quiet, I'm kind of like trying to be cool (laughs). Natsuyaki: Ahahaha. I'd like to see Chii being like that~! Tokunaga: But when I'm with Miya, I want to be excitedly having fun. Since it's not like Miya is always next to me. Though it doesn't happen at places where we're working, but when we're overseas, or when we're going for a meal with the members, at places where we can make a ruckus, we'll often be close to one another. Natsuyaki: Who you want to be with depends on the place or location, right? We both enjoy the fun times, so we naturally end up together at those times. We want to be together, right? 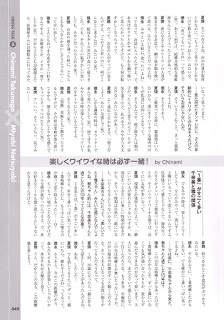 For Chinami-chan, it feels like 'Fun=Miyabi-chan'. Miyabi-chan, in your case, what are your thoughts on these 10 years you've spent with Chinami-chan. Natsuyaki: I've got lots of 'number ones' with Chinami. I've probably laughed with her the most, and fought with her the most. There have even been times when I really hated talking with you..... right? Tokunaga: This was when we were still small, but sticker exchanging was really popular. And it was probably since our favourite stickers were relatively similar. Natsuyaki: We butted heads since they were similar, something like that. Tokunaga: That was it, it might have been our biggest fight. But I'm sure that you're the one I've laughed with the most. Well then, on the contrary, Chinami-chan, from your perspective, how have these 10 years spent with Miyabi-chan been like? Tokunaga: While we may have fought in these 10 years, I feel that we can just go on hanging out like always. Maybe it's because we've fought with one another the most that we don't have to be on guard even when we're together all the time. Once we've grown up, I wonder how we'll be like? Probably, as we age, we won't be fighting in the future. So I feel that the recent state will just continue on. I'm sure that we'll still go shopping, even when we're grown up. Natsuyaki: We've once talked about living together once we turned twenty. Tokunaga: Ah, we have, we have! 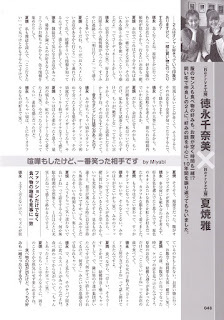 Natsuyaki: But as we discussed it, we felt that we'd tire of one another if we were together all the time. Tokunaga: That's right. Like since we have this current distance, just hanging out with one another is plenty of fun. So that's probably the right move. Natsuyaki: Yup, so in the future, let's enjoy this sense of distance.